This designer engagement ring creates an antique feel with its beautiful halo setting and milgrain texture around the edges of the shiny 18k white gold band. Two surprise diamonds under the center diamond add extra sparkle to the side view. This ring can be set with a round, princess, asscher, oval, radiant, emerald, or pear shaped diamond, and total weight of the halo and surprise diamonds is 0.4 carats. Hand engraving? Check. Side stones? Check. Pave diamonds? Check. Center diamond of your choice? Check. Yeah, this ring has pretty much everything. Exquisite detailing graces every aspect of this antique-style engagement ring. First, the platinum band is decorated with delicate hand engraved accents on all three outer-facing sides (leaving the inside smooth for comfort). 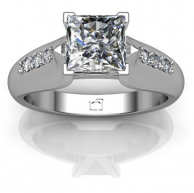 Next, your center diamond is accented by a diamond side stone on either side. Then, three pave diamonds are lined up in a row right next to the side stones for even more sparkle. Also a versatile setting, this ring can be set with any diamond shape. 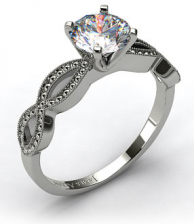 Exquisite vintage-style engagement ring with ornate pave diamond detailing around the band. Brilliant diamonds wrap around your cushion cut center diamond, providing extra sparkle. The 18k white gold band is lined with even more pave diamonds, and milgrain detailing throughout creates a vintage feel. Two surprise diamonds under the center stone provide an unexpected sparkle! This setting is built for a cushion cut diamond, but can also be set with a round diamond (but we suggest sticking with a cushion!). 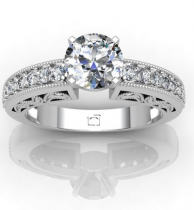 The styling on this engagement ring hails from times of sophistication and elegant details. Milgrain detailing and engraved half-moon scrolls provide accents in the form of texture, and pave diamonds add sparkle to this 14k white gold setting, along with your center diamond. Any shape or size diamond can be set in this ring, and it's not even super expensive! Intricately and delicately crafted, this antique-style engagement ring packs micropave diamonds in its platinum band to add immense sparkle and style. 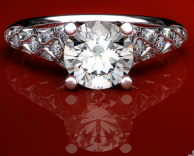 Your center diamond will be secured by a double prong basket to hold it and show it off. 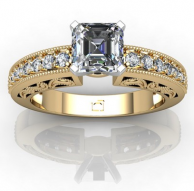 Select a round, princess, or asscher cut diamond to put in the center of this ring. Milgrain engraving and intricate scroll details make this antique engagement ring stand out fron the rest. The 18k yellow gold setting includes 16 channel-set round diamonds totaling 1/3 carats (excluding your center diamond, of course!). Your center stone can be any size and shape diamond. This elegant antique-style engagement ring features a wide 14k white gold band with 3 small diamond sidestones on either side of the center stone. This is a great choice for a affordable, vintage-inspired ring that isn't overloaded with details. The center diamond can be any shape and size.